Amore Beds has created three different mattresses they believe will suit every sleeper. The three beds are the Amore Soft, Amore Medium and Amore Firm. Amore also offers a dual comfort option for partners who have different firmness preferences. Read our Dual Comfort Therapeutic Copper-Ion Amore Beds Review to find out more before you buy. 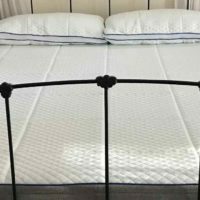 We slept on the Amore dual comfort therapeutic copper-ion mattress. One side of the bed was a medium firmness and the other side soft. We found that the Amore Medium is a good blend of firmness, coming in at a 5-6 out of 10 in our firmness rating. (10 being the firmest.) The firm side of the Amore dual comfort bed was between a 7-8 out of 10 firmness. 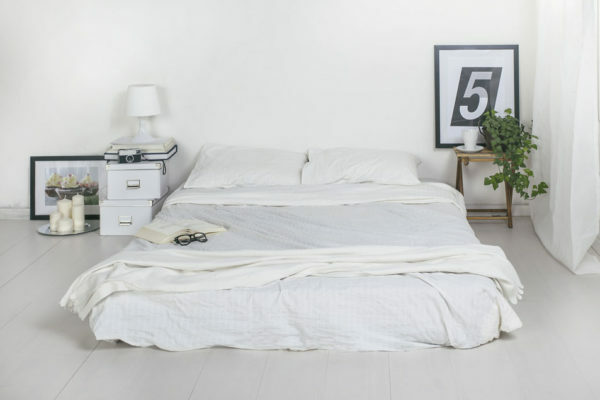 If you like firmer mattresses, Amore makes the bed for you. We found that we sunk into the firm side of the bed around 1″. The depth was a little bit more on the medium side, but not by much. There isn’t much give with the Amore when you lay on it. Side sleepers should buy the Amore Soft as the medium and firm are most likely too firm. The upside of the firmer bed was the high level of responsiveness. We woke feeling energetic and ready to go. There was no sluggishness that comes with overly soft mattresses. We also found surprisingly little horizontal motion with this bed. Tossing and turning during the night will not disrupt your neighbor. We upgraded to the Therapeutic Copper-Ion for our Amore Beds review and had no issues with heat at all. The Amore beds come with a cover made of copper-ion infused bamboo rayon. The copper has cooling properties as well as anti-bacterial and anti-microbial properties. The top memory foam layer includes graphite to help pull heat away from the sleeper. When we opened the Amore mattress box there was a slight smell. All box mattresses tend to have a slight odor when opened, but this will dissipate after an hour or two. Each layer meets and exceeds the demanding standards of the mattress industry. As a back sleeper the Amore medium provided an excellent night sleep. The spring/foam combination give superb support that won’t leave you aching in the morning. The Amore mattress was very responsive. This is ideal for active couples looking for an energetic sleep. The graphite memory foam and therapeutic copper-ion cover work well to provide a very cool sleep. We had no issues with heat even in a hot scenario. We have worked with Amore Beds to bring our readers a $60 promo code for first-time shoppers. Click the link below to head over and use our Amore Beds Discount. We will keep this page updated with any new Amore coupons or promos if anything changes. We Provide “A More” Thorough Look Into This Bed. Amore has built their 11″ bed with four layers of different materials. In our Amore Beds review, we break down the what each layer does and how they work together. It is important to know what is inside the bed to understand why the mattress feels a certain way. 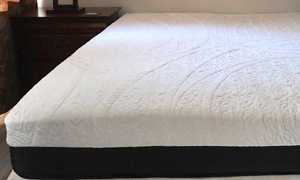 The Cover of the standard Amore Bed is 1″ of highly breathable cotton with GOTS wool quilted into the fabric. 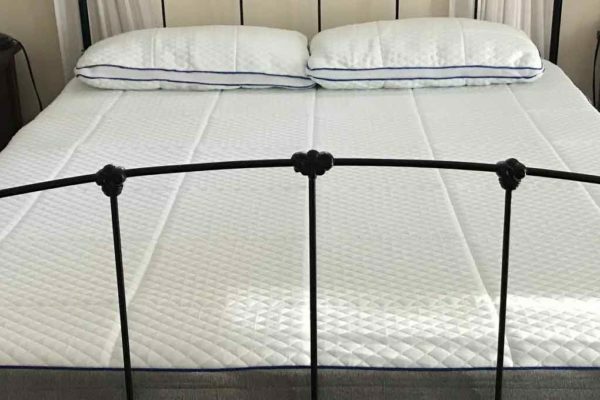 Customers looking for a cooler, healthier sleep can upgrade to a therapeutic copper-ion infused bamboo rayon mattress cover. Copper ion technology is currently undergoing FDA testing to understand the anti-bacterial properties better. 4″ of Poly foam give the softness for side and back sleepers. The foam conforms to your body and provides a uniform pressure relief to the sleeper’s body. 4″ of Pocketed coils provide the support structure for the Amore Bed Mattress. We tend to prefer pocketed coils as they give a more active and energetic sleep. 2″ of high-density foam provide the final foundation layer. This bottom layer brings the entire mattress together and offers the firm base. Amore is a fantastic value for the price of this mattress. The Amore Queen will run customers $775 which is cheaper than most of the other beds out there. Amore says they have such low prices because they cut out the middle man. They operate entirely online, making their beds custom to your order. 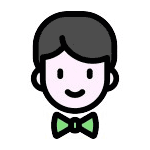 Custom ordering reduces overhead and inventory costs which Amore passes onto the customer. 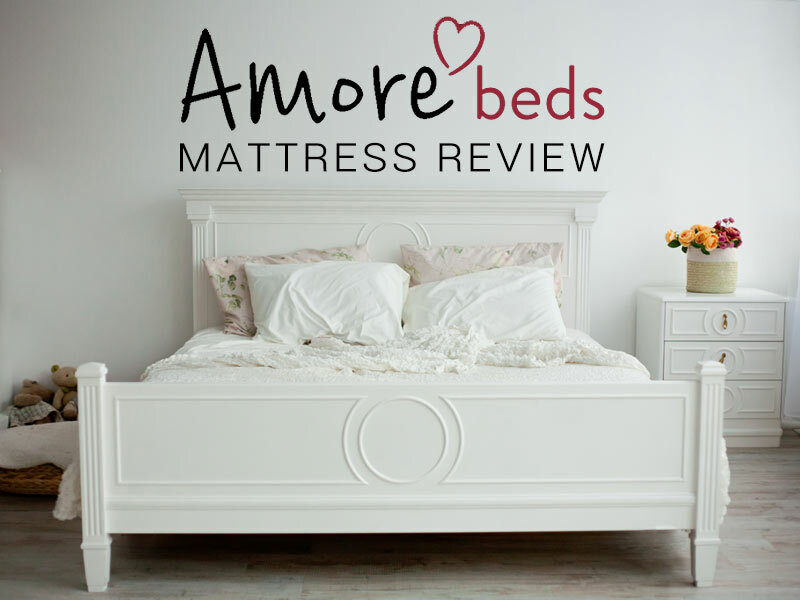 Let us know what you think about the price in our Amore Beds Review comments section. 100 night stress free trial period. If you don’t like the bed, return it hassle free. We found the Amore Medium/Firm to have great support, but they do run a bit on the firmer side. Don’t expect the mattress to feel like a cloud. If you want a plush sleep, try the Amore Soft mattress. Amore Beds has a high level of responsiveness which made it ideal for active sleepers. We recommend the Amore Medium/Firm to anyone who likes firmer beds with terrific support. Use the code to the right for the Amore Beds Promo Code and save $60. I’m interested in buying a queen size firm with copper mattress. 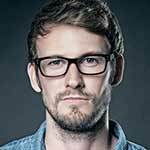 I spoke with a sales representative (possibly Clint) back on Black Friday.. He was waiting for the financing to become available to offer to me . Also Black Friday was offering the copper infusion at no cost. I know it’s been a while but I’m ready to purchase the bed in full at the Black Friday price.